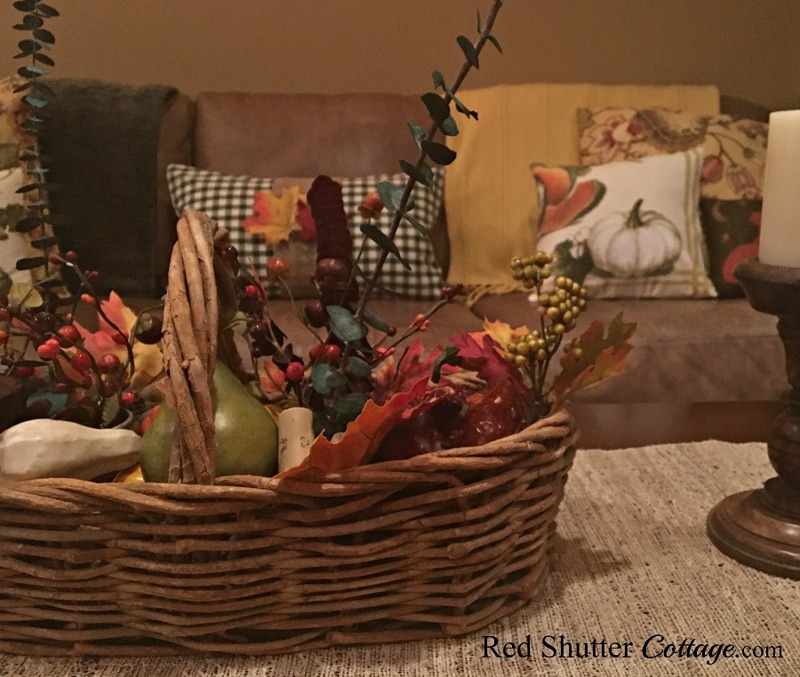 Welcome to the 2017 Festive Fall Home Tour at Red Shutter Cottage! Thank you so much for coming by! 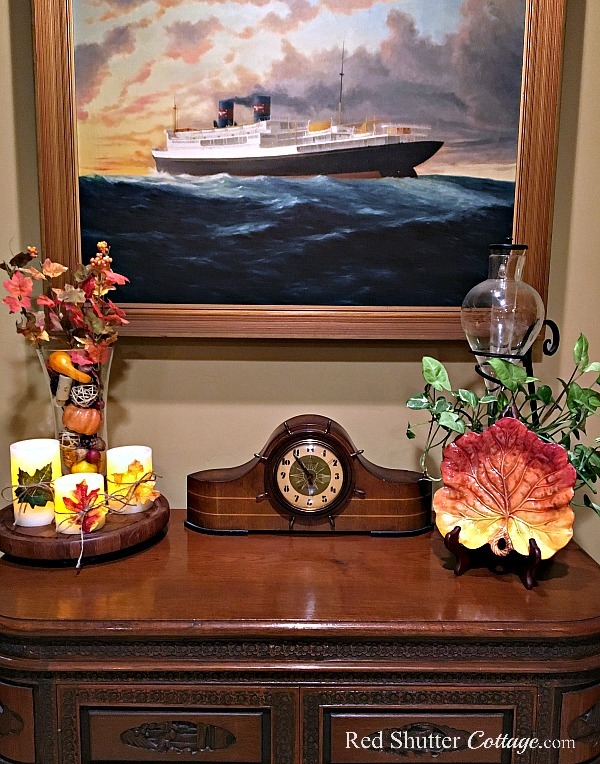 I hope you find inspiration and ideas here for your own Fall decorating. 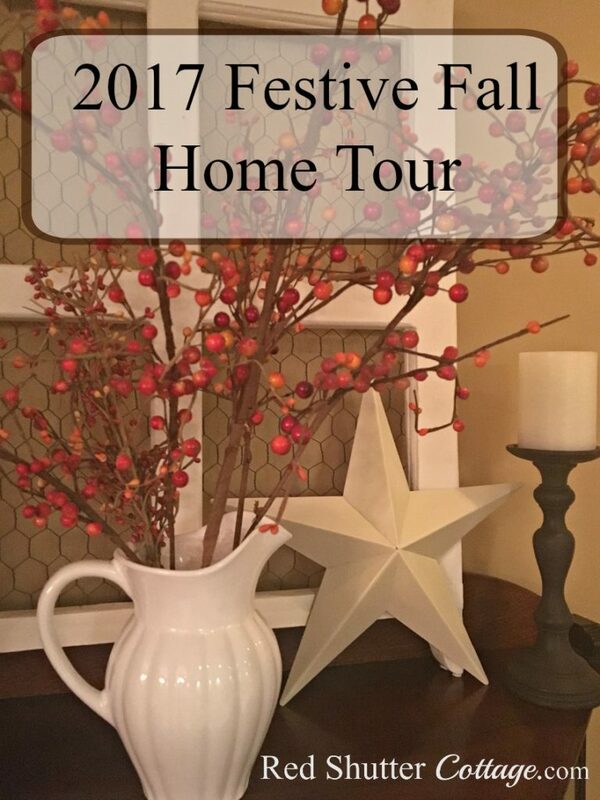 Please make sure to visit the Festive Fall Home Tours of 4 more very talented bloggers, all listed at the end of my post. And a special thank you to Kristy for leading us all on this tour! 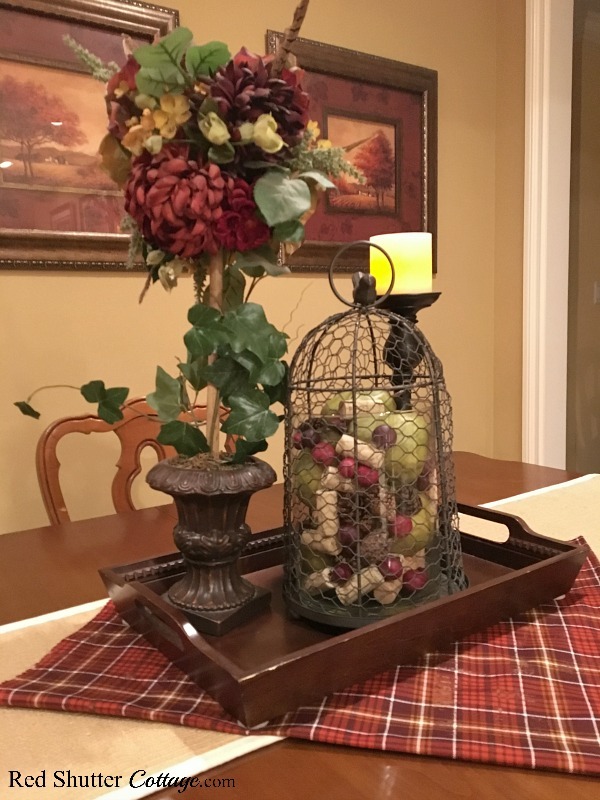 Let’s start here with a simple little salute to Fall — candles decorated with leaves, and a vase filled with harvest fruit, pine cones and wine corks. 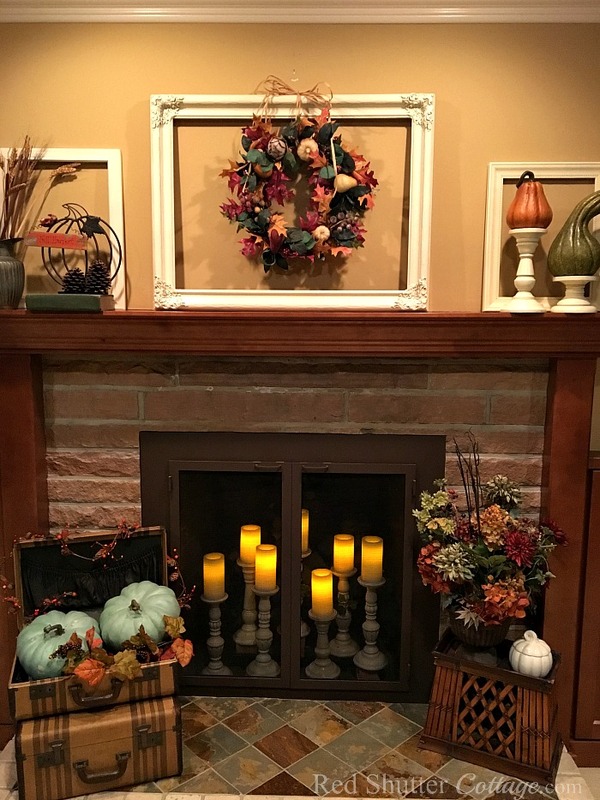 Our fireplace and mantel get a complete redo for each season. For this Fall, I propped up an old frame that I had spray painted antique white; I was drawn to the really pretty detail in the corners. I tied a wreath to it holding artichokes, pears, gourds and grapes. 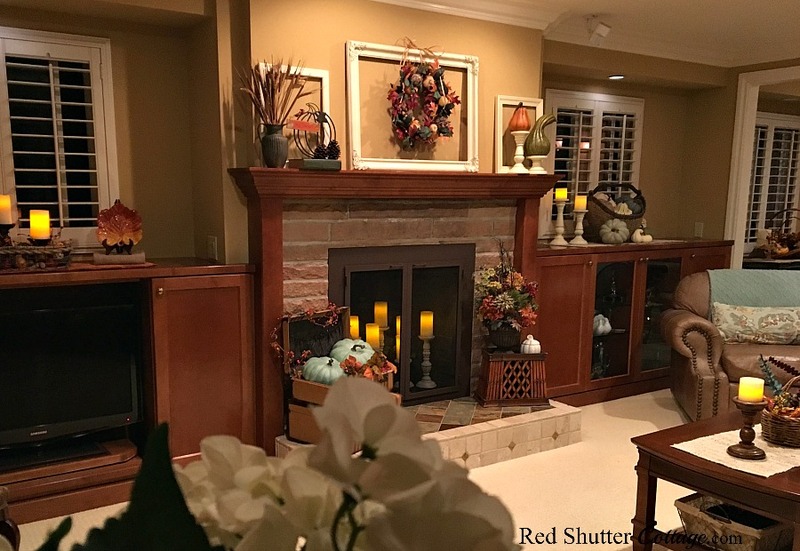 For this 2017 Fall Home Tour, I wanted to really focus more on the wide variety colors that are part of the Fall spectrum. 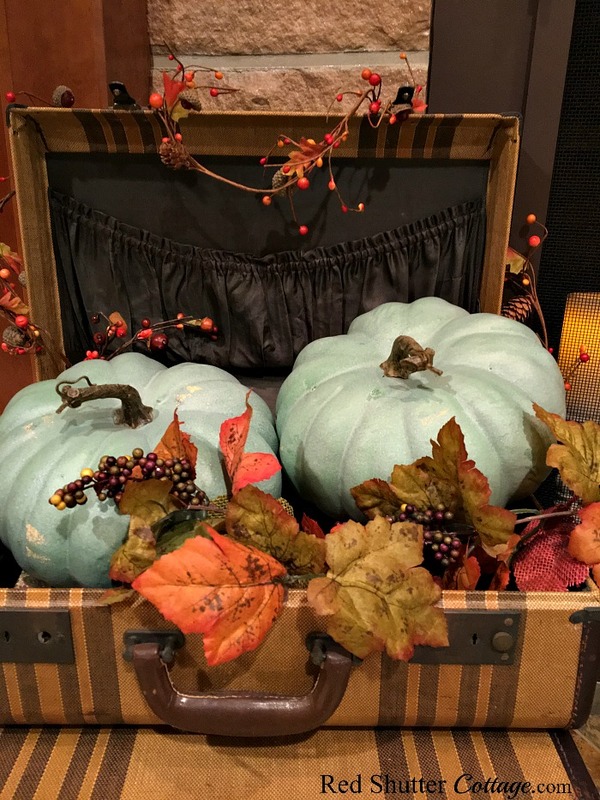 And I will admit to being a little bit influenced by some of the more neutral colors I have been seeing on other blogs lately…which led me to my new teal pumpkins! 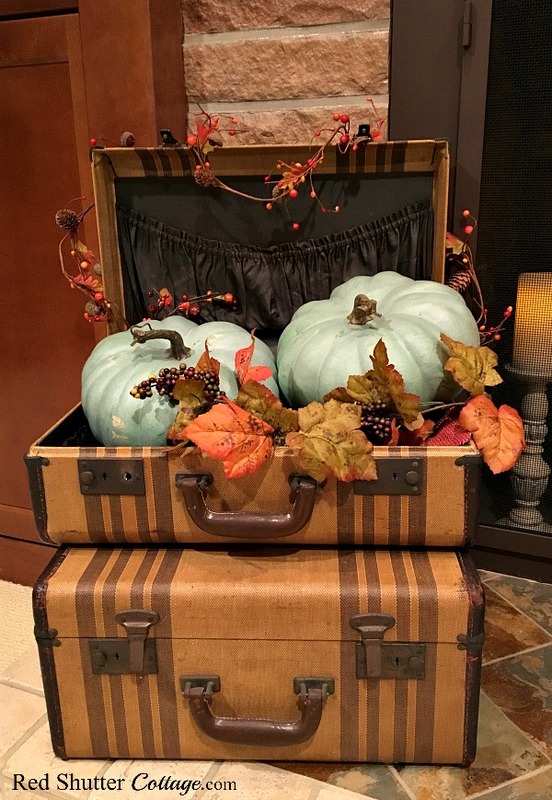 This is way out of my comfort zone, but I am actually quite happy with how these teal pumpkins fit in so nicely with the darker tones of the suitcases, as well as the bright berry colors of the bittersweet strands. 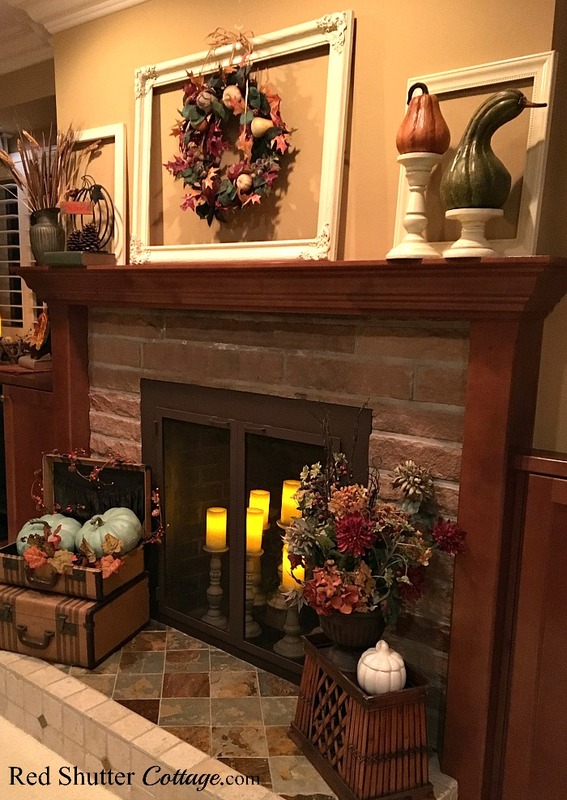 Flanking either side of the mantel and fireplace are built-ins that provide a great opportunity for more Fall vignettes. This one shows that influence of more neutral colors. I’m an ‘orange’ girl from ‘way back, but I like these cooler, calmer colors just as much as my orange, russet and terra cotta tones. Across from the fireplace is the coffee table and couch. 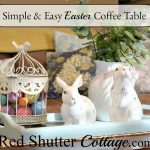 With so much focus on the mantel, fireplace and hearth, I wanted to keep the coffee table a little bit more simple and subdued. The couch is loaded up with throws and pillows. The ‘pumpkin’ pillows are sewn from tea towels I bought at Williams Sonoma a few years back. The green plaid pillow is an idea I have had for a little while. I bought the fabric at Joann’s, and wrapped a run of burlap around it, with a couple of leaves affixed to the burlap with small little stitches. 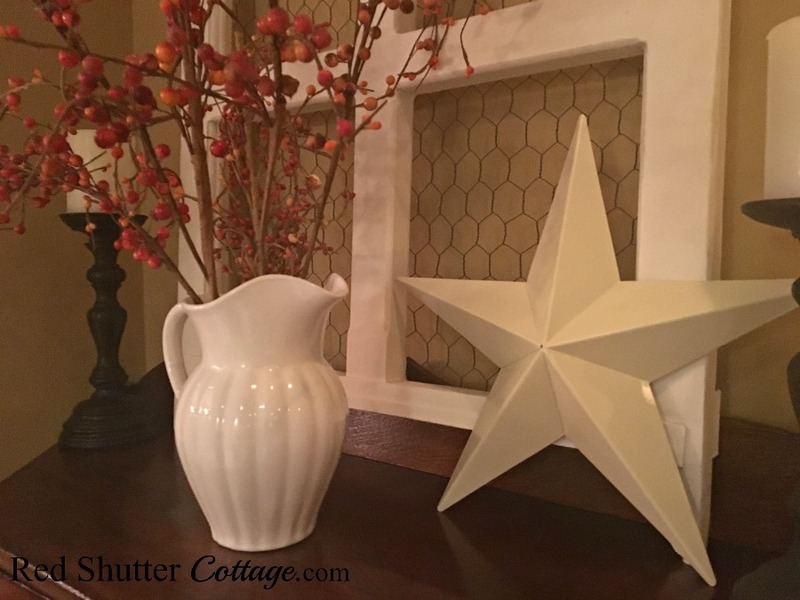 This vignette sits atop a glass display case that is holding my collection of white pitchers. Ironstone does not seem to be available in California, so my collection of white pitchers will have to do for now. I found the window frame on a Sunday morning walk; it had been put out with the trash cans. I pulled the window frame to the side, away from the trash cans, got home as fast as I could, jumped into my car and drove back to where I found it. Sailor did most of the heavy work, building the section pieces and adding the chicken wire. I did the sanding and the painting. 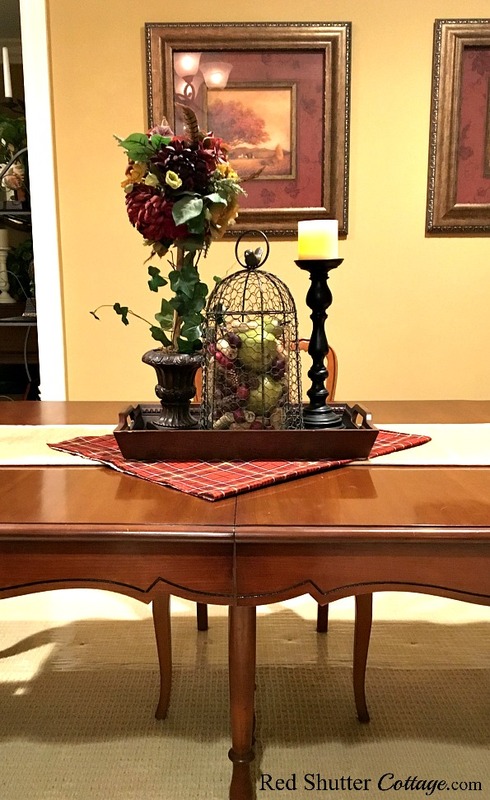 In the dining room, I wanted a simple look. I have had the topiary for 10 years or so, and it comes out every Fall. I have combined it here with a cloche filled with pears, berries, wine corks and pine cones, and a tall candleholder. The plaid fabric (I seem to be having a thing for plaid these days!) comes from Joann’s. 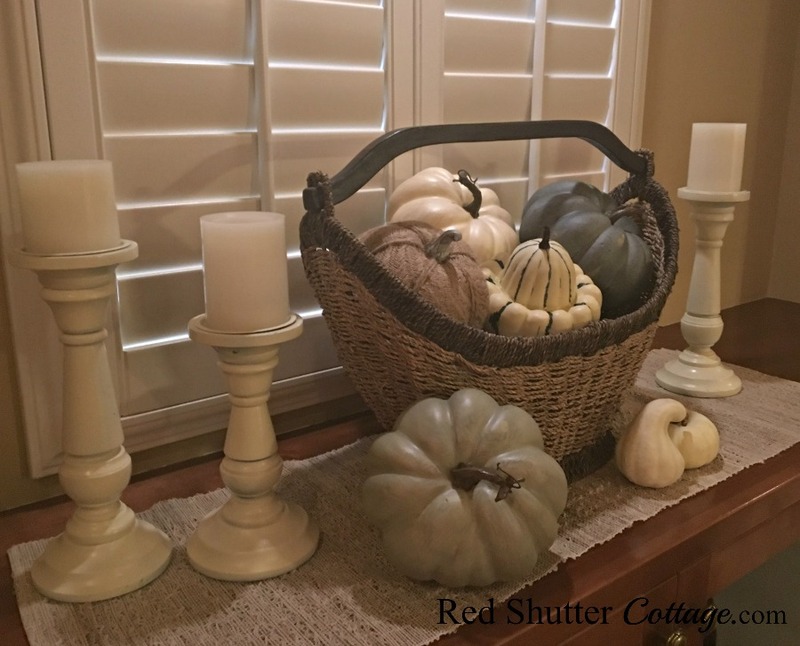 For some more ideas for Fall dining tables, please take a look at this post, 3 Fall Dining Table Vignettes. 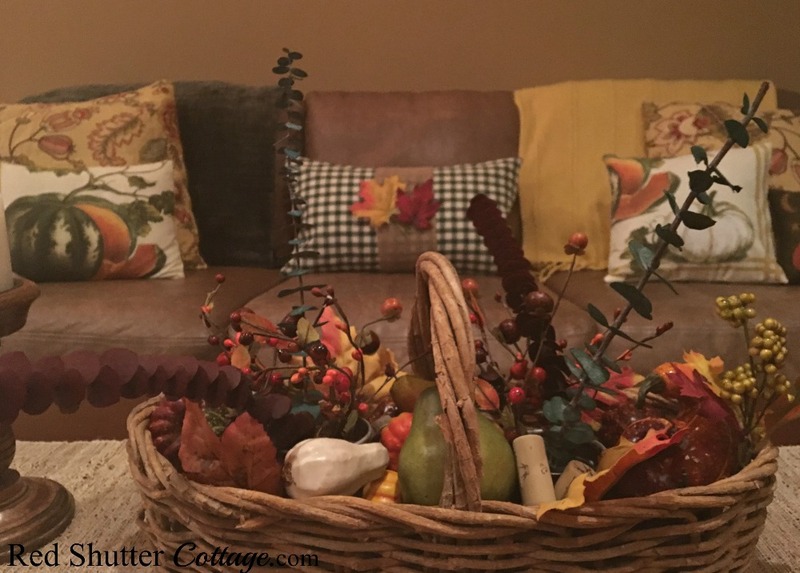 If you are looking for ideas or inspiration for Fall, I hope something you have seen here has triggered your creativity! Fall is such a lovely season, with its range of colors, scents and textures. 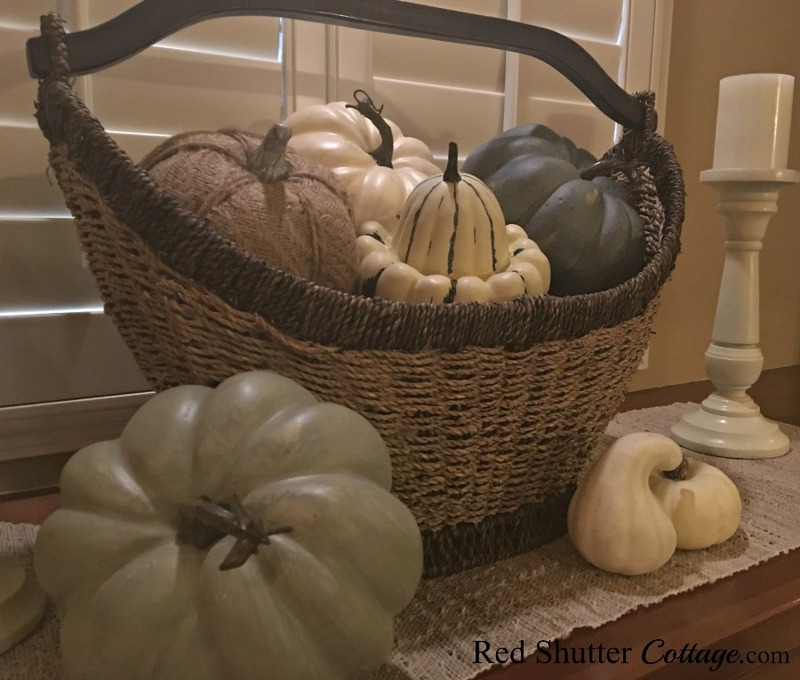 We can decorate using gourds, pumpkins, berries, leaves, fruit, branches, pine cones…the list is almost endless. Whatever Fall decorating you do, I hope it brings you true enjoyment of this special season! For even more Fall inspiration, please visit these blogs! Of Faeries and Fauna Craft Co. I love the addition of teal in your design! Since my living room colors are on the cool side (mostly blues and gray, plus pops of orange for interest), I’m so happy fall decorations are now available in my color scheme. 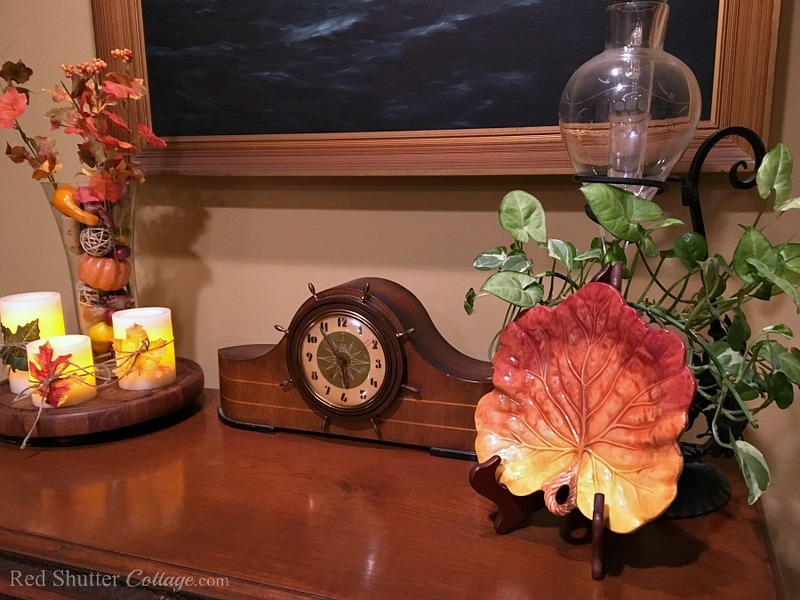 Fall is such a great time to decorate for warmth and welcoming vignettes. Your home looks lovely! Thank you Janis! There was a time I would have NEVER considered bringing in the blues and pale greens and teals for Fall. But clearly they have taken hold in people’s decorating, which is a good thing. 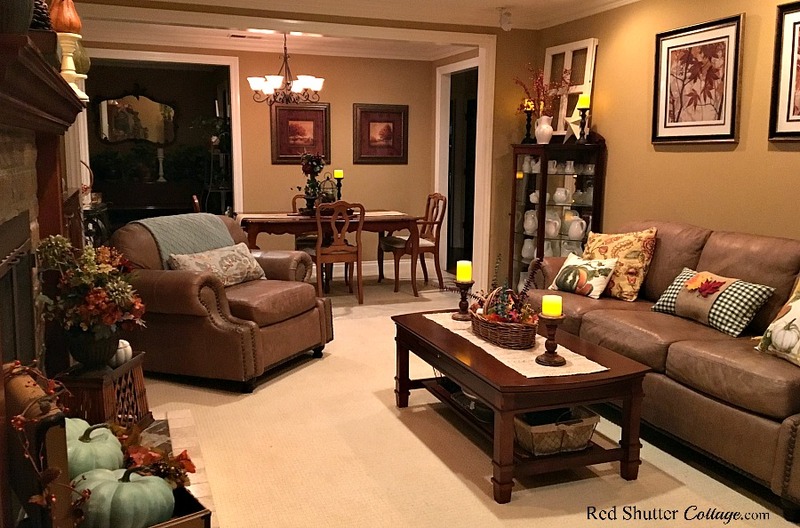 Variety and options make decorating easier for everyone. I think your genius. Placing pumpkins in a suitcase! I love it! 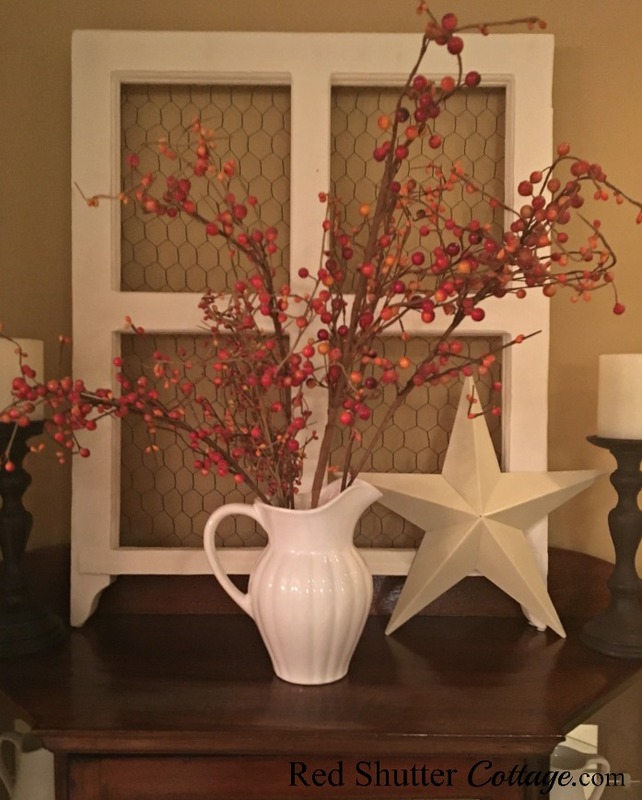 Your Vignettes are perfect and your vase fillers inspired! Love the corks! Thank you Jeannee! Those pumpkins have really gotten some attention !! I do love using wine corks, and I somehow manage to keep myself pretty well supplied! I literally use them all year round – they are so versatile! Thank you for stopping by! 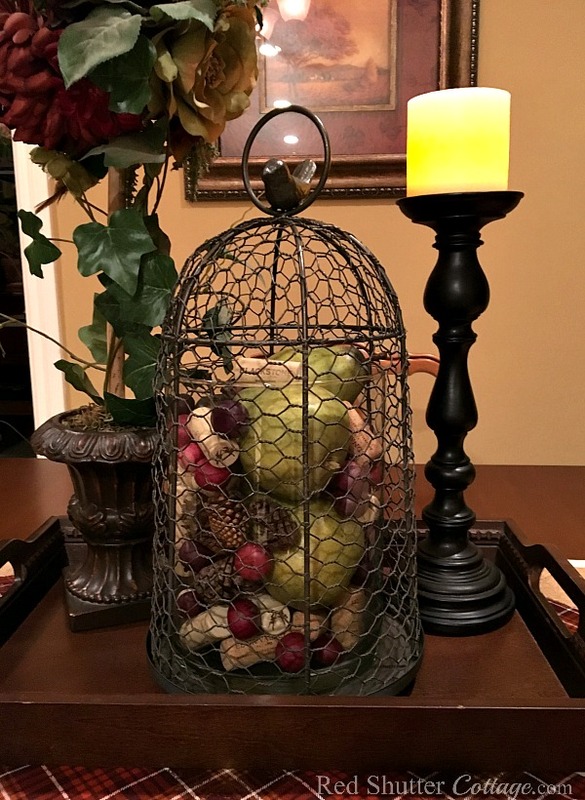 Beautiful Fall decor, Kristine! 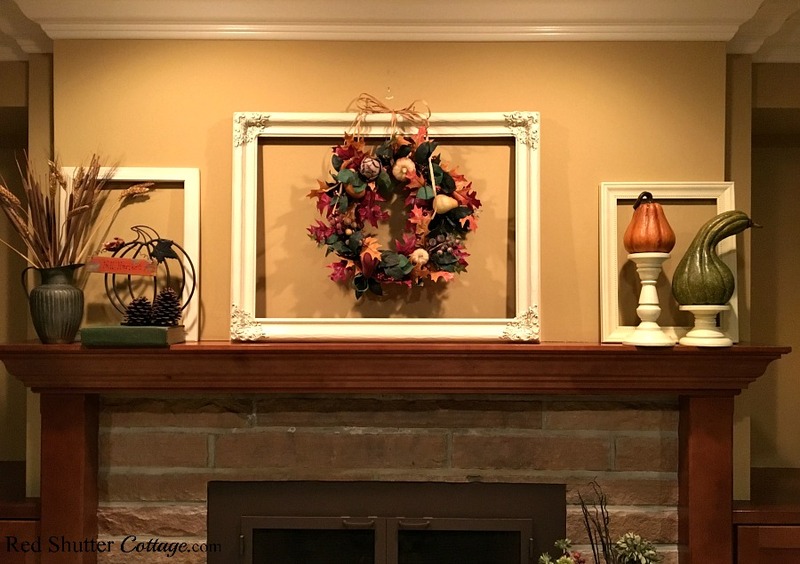 I love how you tied the wreath onto the white frame above your fireplace. 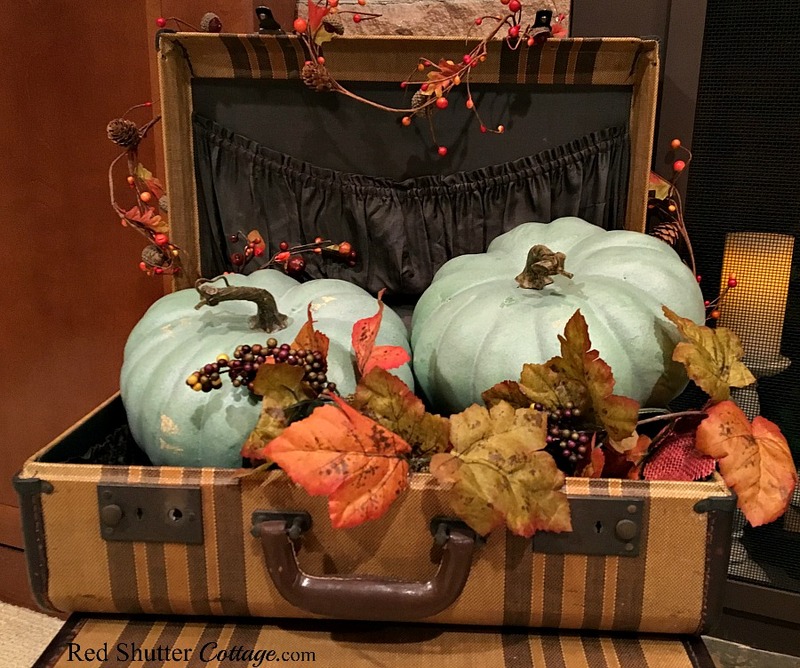 And I adore those teal pumpkins! Thank you so much Kristy! That was one of those “what shall I do over the mantel this year” moments, and it happily came together. When I bought those teal pumpkins, I was practically crossing my fingers, thinking “I hope I can figure out what to do with these!”. Thank you for heading-up our blog hop!! 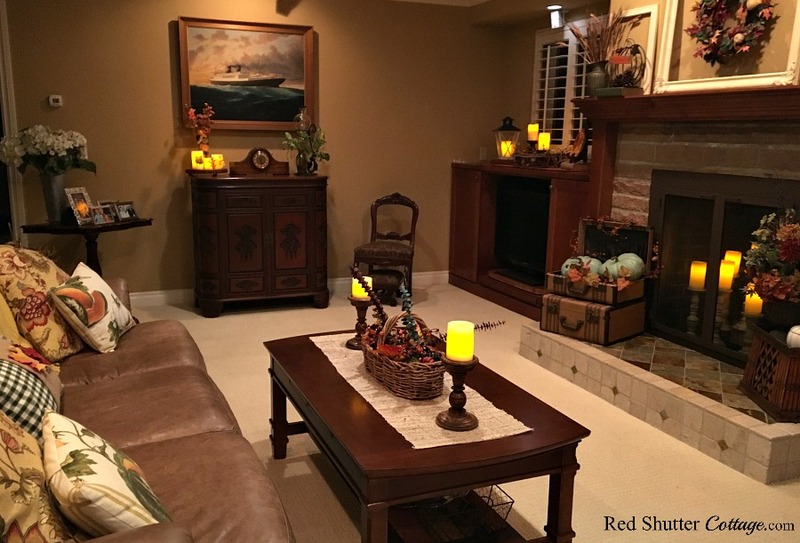 Thank you for sharing your home dressed up for FALL! My most favorite thing of all was the suitcases with the pumpkins display. I have not seen that before and though I just sold a house furnished that had some great suitcases I could have done that with, I will definitely keep that in mind for a future antique shopping day. Happy Fall! Thank you Debbie! I only wish you could have joined us in this blog hop! The response I have received about the teal pumpkins has been astonishing – but in a good way! The suitcases have been great – I have actually used them in more ways than I ever expected. Thank you for coming by ! !